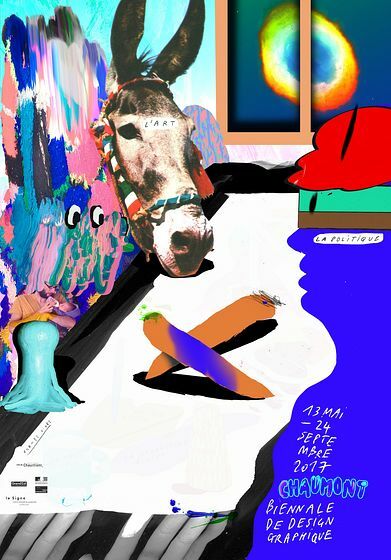 This event is the suite of 26 editions of a major festival for graphic design and for Chaumont. Le Signe now offers this permanent venue for the discipline and its actors. Le Signe, with the exceptional cultural facilities, proposes a comprehensive program all year round, including exhibitions, workshops for all audiences as part of laboratory for creating forms, student workshops, lectures, gatherings and vocational training courses, as well as a cycle for discovering graphic design intended for the young. Le Signe manages a collection of close to 50 000 posters giving researchers, teachers and students access to it on site or by means of on-line resources. A resource centre is shortly to come in order to accompany research in design. The program of le Signe is now enhanced and unfolded every two years, in the springtime during the Biennale de design graphique de Chaumont. Its program is based on all the ingredients that have ensured the success of the event so far and offers even denser moments to share ideas and meet up. The 2017 Biennale de design graphique gives a particular focus on transmission and research by proposing 7 workshops for students and young professionals, an exhibition of the student competition that questioned the production of signs and tools for the transmission of knowledge, and an exhibition designed as a cartography of graphic design research. Contemporary poster design will be present in the exhibition of the international poster competition while public space will be punctuated by various installations. Lectures, participative workshops, a salon for graphic design editions and activities free of charge and open to all audiences complete this program. The Biennale Village will locate on the Place des Arts, in front of le Signe. In the Village you can have a drink, a meal and attend concerts every day from 13 to 21 May. The Biennale hence questions the practices and the development of graphic design in a festive and friendly atmosphere favourable to exchanges and discoveries. Come and discover le Signe and its team!